Wolves are known to be lazy hunters. Consequently, they will always choose the easiest prey, meaning young, sick or old animals. This preference for easy prey significantly influences the population dynamics and compositions of the preyed animals, for example deer or wild boar. In particular, during disease outbreaks the wolf plays a crucial role to keep the number of infested animals at bay. Data from Slovakia underlines the wolf’s important position as the doctor of the wild. The African Swine Fever travelled from Africa to Europe and first reports of it in Central Europe were published in 2007. The disease infested wild boar populations all over Europe and also spread to domestic pigs in some countries. While an analysis of the EFSA could not confirm a correlation between the number of reported outbreaks in domestic pigs and the number of reported African swine fever cases of wild boars, the virus spreads through Europe by direct contact with blood or other body fluids of infected animals. This means contaminated transport vehicles, clothes, tools, hunting and farming equipment form a high risk to spreading the virus. A recent study by the German Friedrich-Löffler Institute rated the risk of an entry of the African swine fever into German through infected wild boar as moderate. However farmer and hunting associations, for example in Germany, demand the reduction of the wild boar populations. Even though the same study confirmed that such a population reduction through intensified hunting is of little avail. Anthropogenic causes remain the main causes of the diseases’ spreading over large distances across Europe and Africa. Next to import bans and population monitoring, passive monitoring has been proven to be the most effective prevention measure to keep the virus at bay. Passive monitoring means natural measures or selection by non-human hunters. In most parts of Europe this means the wolf. Wild boar is one of the main food sources of the wolf. Wolves prefer easy prey, meaning sick or weak animals, as this makes hunting easier and less risky for them. As the virus is not harmful to other wild animals, wolves can play an essential role in the diseases management. An example of Slovakia highlights the role of the wolf in the management of Swine fever outbreaks. Numerous studies prove the wolf’s far reaching effects on ecosystems. The management of wild boar or deer populations are just two examples of them. Two Slovakian studies from the 1990s and 2000s show that the Slovakian wolf packs keep their territories mostly or completly free of the Swine fever. Overlapping maps of the wolf pack territories and the Swine fever outbreaks underline this fact. “Spread of the wolf in Slovakia and localities with Classic Swine Fever (CSF) in wild boars in 1994-1998” Blue: areas where no wolves live. White: areas with wolf pack. Little black rings: wolf occurrences. Black spots: locations where CSF has broken out. 93% of CSF cases occurred outside the areas with wolf packs (blue colour). Only 7% of CSF cases have been recorded in wolf areas (white colour). Infested animals show signs of the infection within a few days and are consequently weaker and slower than healthy individuals. This makes them easy prey for the wolves. The killing of infested animals diminishes the epicentres of the disease and thus reduces the possibilities of further spreading it. 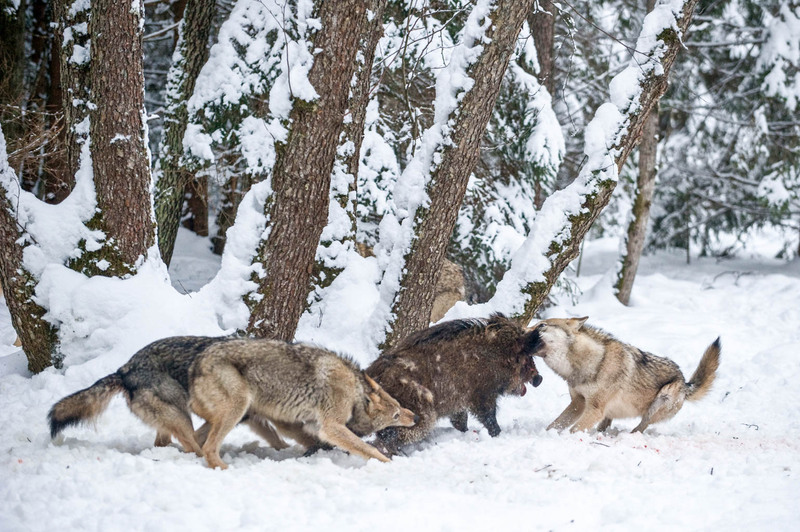 And even though human hunters tried to take this task on, the two studies show that wolves, particularly wolf packs, are significantly more successful in keeping the disease at bay. This further underlines the important role the wolf plays for a healthy ecosystem. Ultimately, there is a reason why we call the wolf the doctor of the wild. Click here to support our work by donating! Stay up to date and subscribe to our Newsletter! Subscribing, I accept the privacy rules of this site. This posting is also available in German and Dutch. Hunters at work – stop brown bear killing!